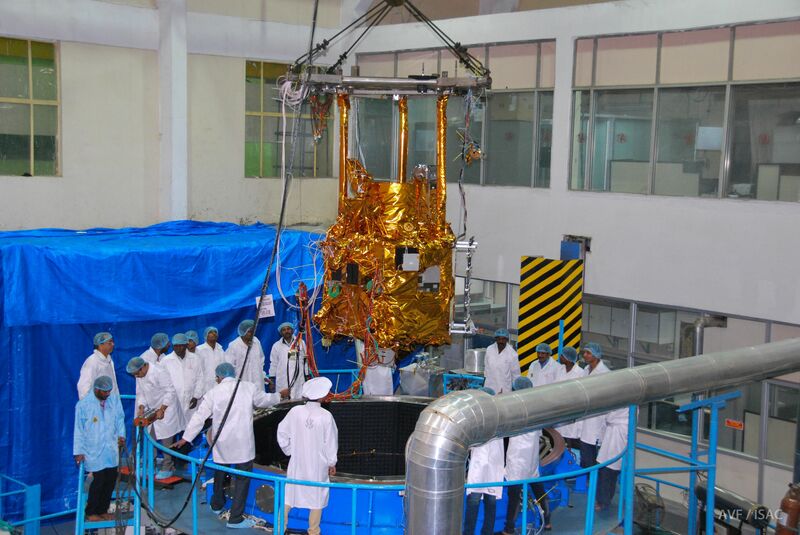 CartoSat 2F, officially only referred to as a CartoSat 2 Series Satellite, is the seventh in India’s second generation of CartoSat Earth Observation craft tasked with the collection of high-resolution imagery, employing a high-degree of agility on the satellites to support event monitoring with high revisit times. The CartoSat-2F launch follows up on the CartoSat-2E mission that launched in June 2017 and is a nearly identical copy of the 2C, 2D & 2E satellites, carrying the same instruments and operating from a similar orbit. Previous CartoSat missions used a Sun Synchronous Orbit 640 Kilometers in altitude while the newer ones fly at 505 Kilometers in order to increase the resolution of the panchromatic and multispectral cameras aboard the satellites. 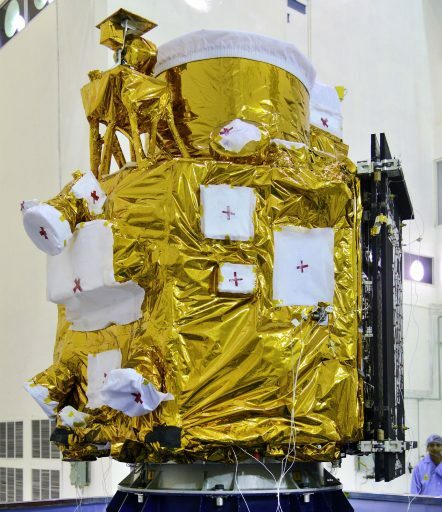 The satellites are based on the IRS-2 Satellite Bus (Indian Remote Sensing Satellite) and are operated by the Indian Space Research Organization. 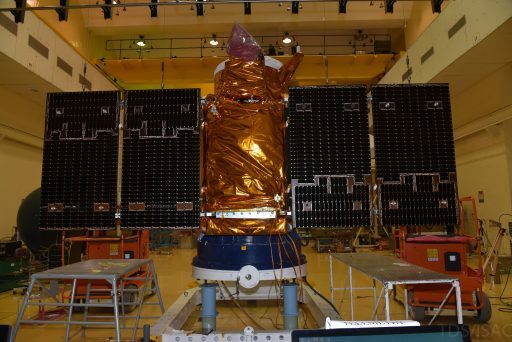 ISRO’s first indigenous Remote Sensing Satellite, IRS-1A, was lifted into orbit by a Russian Vostok rocket in 1988. More followed in 1991, ’94, 95 and ’96 and two were lost in launch failures in 1993 and 97. The first satellite launched under the Cartosat-1 designation was IRS-P5 in 2005. The second generation of Cartosat spacecraft was inaugurated in 2007 when Cartosat-2 was delivered to orbit by a PSLV rocket, however, the satellite suffered problems after arriving in orbit and was only partially usable. An improved version, Cartosat-2A launched in 2008 followed by the 2B satellite in 2010 and 2C in 2016. 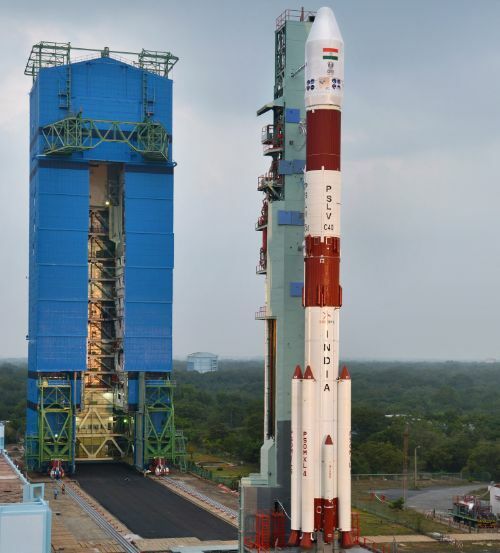 CartoSat-2F weighs 710 Kilograms and employs a hexagonal bus structure comprised of a Carbon Fiber Reinforced Plastic structure. The satellite stands approximately 2.5 meters tall and is 2.4 meters in diameter. A pair of solar arrays covered with triple-junction solar cells to deliver power to the satellite bus and payload systems. The solar arrays generate 986 Watts of power when in sun-pointed mode and the satellite hosts an 18 Amp-hour Nickel-Cadmium battery unit. A central Bus Management Unit is in control of all satellite subsystems including Telemetry, Telecommand and Control, Attitude Determination and Control and thermal control. Attitude determination is accomplished with new high-performance star sensors built in Europe, an improved Inertial Measurement Unit and sun sensors used during safe mode attitude hold operations. Actuation of the satellite’s orientation is completed with high-torque reaction wheels, magnetic torquers for unloading of the wheels and hydrazine thrusters for safe mode control and orbital maneuvers. 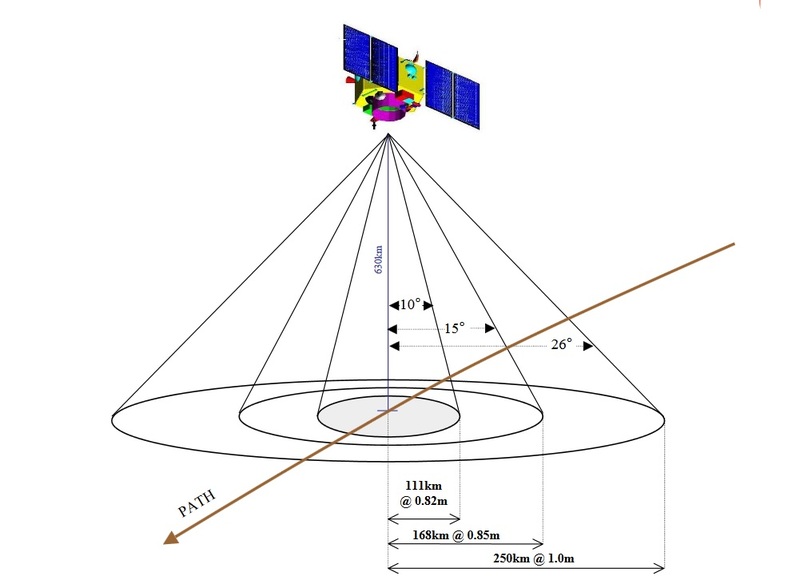 The satellite achieves an attitude knowledge of +/-0.01° and a pointing accuracy of +/-0.05°. This translates to a ground accuracy of 100 meters, suitable for high-precision imaging of locations of interest. The four reaction wheels each have a momentum capacity of 15Nms and a torque capability of 0.3Nm. Eight monopropellant thrusters are installed on the spacecraft, each delivering a thrust of 1 Newton, fed from a 64 Kilogram Hydrazine supply. Cartosat-2 uses a highly agile attitude actuation system, capable of completing imaging operations at off-nadir angles of up to 45 degrees. With this cross-track imaging capability, one satellite reaches a four-day revisit time that can be reduced to one day by means of orbital maneuvers. During typical mission operations, the satellite will face its two-panel solar arrays toward the sun for power generation unless imaging operations are taking place. The satellite is outfitted with an eight-channel GPS receiver for the calculation of instantaneous state vectors and orbital parameters. GPS is also used for GEO-referencing of acquired imaging data. The satellite’s Data Handling System receives 11-bit data from the CCD video processing unit with a data rate of 336 MBit/s and stores processed payload data in a 64 Gbit Solid State Recorder. A two-way gimbaled X-Band (8125MHz) phased array antenna is used to downlink high-speed data to ground stations. Downlink occurs after JPEG compression and encryption of the data at a 105Mbit/s rate. Telemetry and Command Up/Downlink uses S-Band (2067MHz) at a data rate of 4kbit/s. 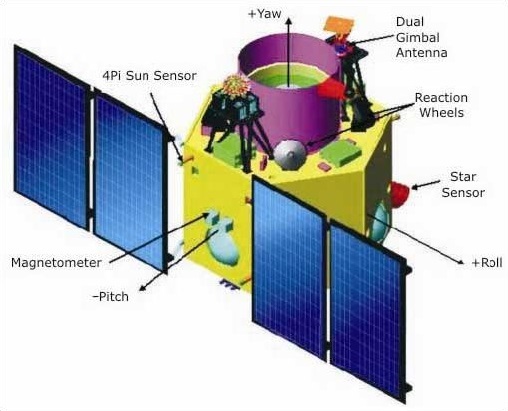 Cartosat-2F is the fourth in the series to host a Multispectral imaging system in addition to the Panchromatic imager. The 120-Kilogram payload is comprised of a two-mirror Ritchey-Chretien Telescope with an on-axis mirror system featuring a concave primary mirror and a convex secondary mirror. The mirrors are made from Zerodur and the telescope structure consists of Carbon-Fiber Reinforced Polymer due to the material’s excellent thermal stability, keeping the optical components in alignment. The telescope has an aperture diameter of 70 centimeters and a focal length of 5.6 meters. In the focal plane resides a Panchromatic and Multispectral detection system using Charged Coupled Devices with 7 µm pixels. The detector system covers a spectral range of 450 to 900 nanometers and reaches a ground resolution of 65 centimeters when employing apparent velocity reduction for along-track imaging. Four MX detectors with bandpass filters between 450 and 860 nanometers deliver imagery at a two-meter ground resolution along a 10-Kilometer swath. The imaging payload can support continuous strip imaging, spot scene imaging and paint brush mode in which roll and pitch of the spacecraft are used to deliver strips of adjacent areas in order to broaden the instantaneous ground swath. The main purpose of the Cartosat-2 satellite series is the generation of imagery for cartography, environmental monitoring, disaster relief and event monitoring.